When it comes to picking the perfect timepiece, practicality and function are important. However, style and design are also essential factors to consider. Even something as simple as the colour is a critical decision that will affect how, when and if you wear your watch in the future. For modern gents, a black watch can be an excellent option. Sleek, contemporary and seriously stylish, these dark designs can work for the office, weekends and evenings out. 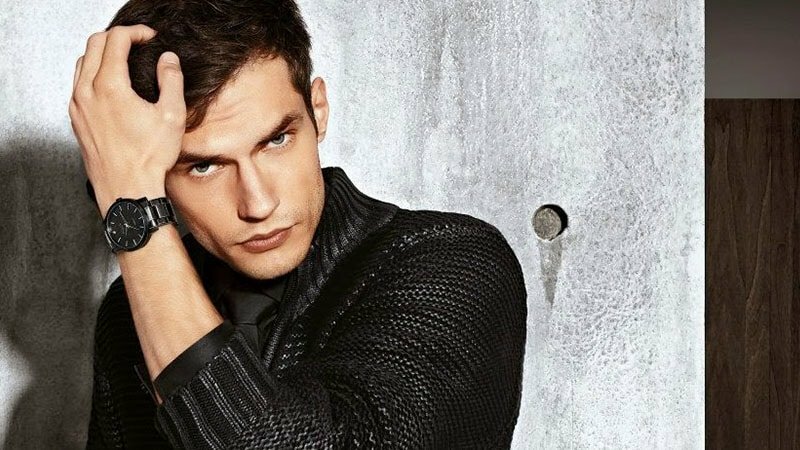 To help you make a decision we have compiled a list of the best black watches for men. 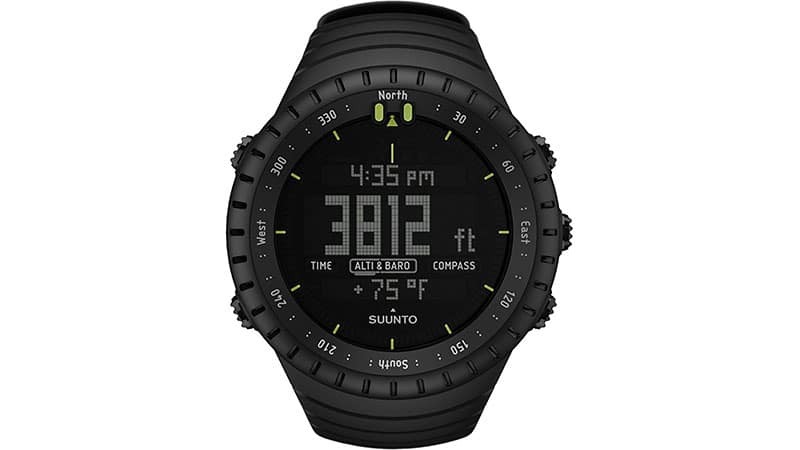 Perfect for gents who like to hike, climb or just get outdoors, the Suunto Core All Black Military Sports Watch features an altimeter, barometer, and compass. 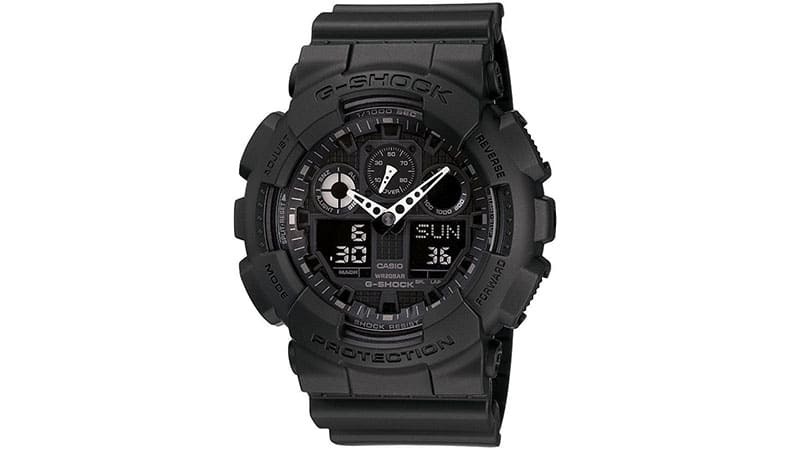 G-Shock’s the GA 100 Military Series Watch is an excellent addition to any man’s watch collection. As tough as it is practical, this masculine timepiece is shock-resistant, water resistant to 200m, and features a 1/1000th-second stopwatch amongst other useful features. 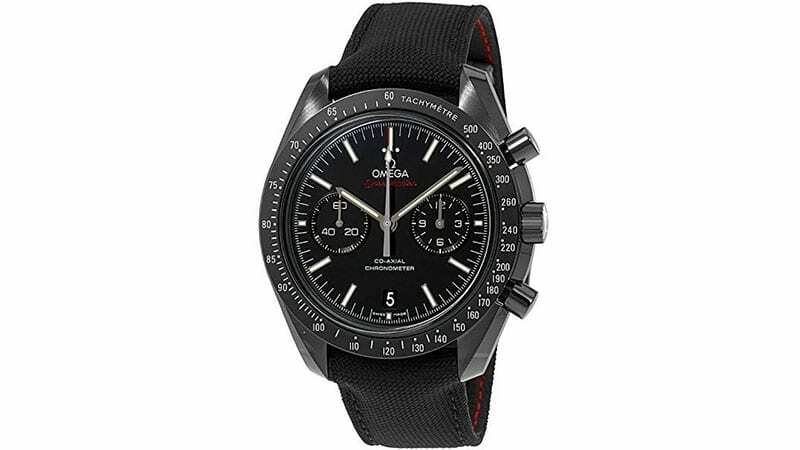 A sleek black design isn’t the only thing that the Omega Speedmaster Moonwatch offers. It also features a chronograph, tachymeter, luminescent hands and hour markers, and a 60-hour power reserve. The Colormark Chronograph Watch from Luminox was designed for functionality, durability and easy reading. As such, it features a chronograph stopwatch, a well-sized and durable 48mm case, self-powered light markers, and 200m water resistance. 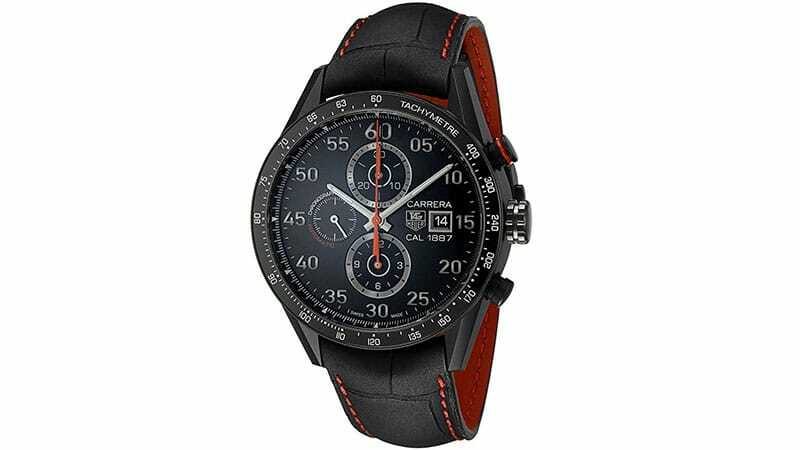 The Tag Heuer Carrera Chronograph Watch features a sleek black design with bold red details. The titanium sports timepiece also features a fixed tachymeter bezel and three chronograph subdials. 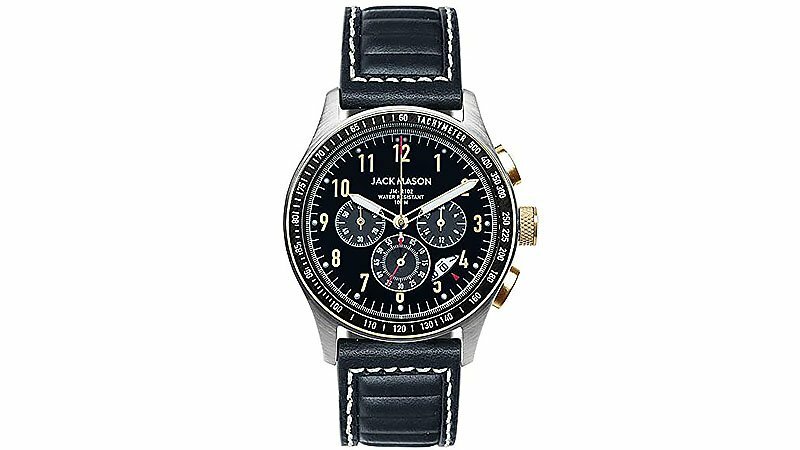 Inspired by the automotive gauges and design of contemporary racecars, Jack Mason Racing Chronograph is sure to attract those who live daringly. The stainless steel 42mm case is paired with an Italian black leather strap for ultimate durability and style. Accented with bronze details, the timepiece has an interchangeable strap making is suitable for everyday wear. It features an easy-to-read dial with SuperLuminova markings and applied indices as well as being water resistant to 100m. The Timex Easy Reader T2N794 is simple yet seriously stylish. 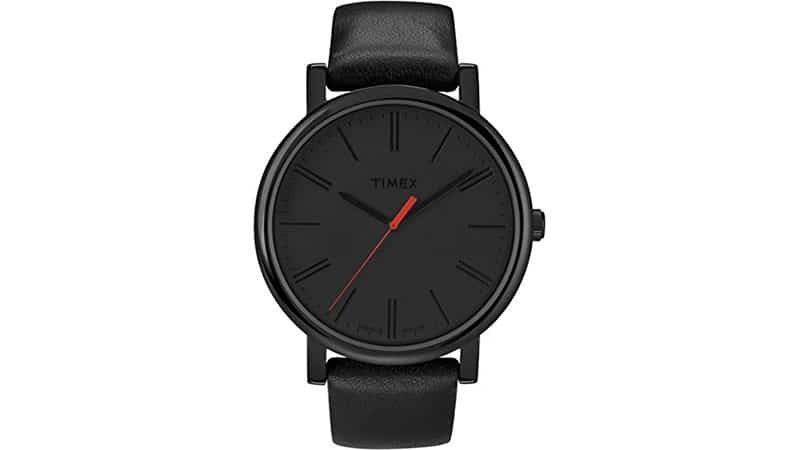 The sleek timepiece features a clean black design with a bright red second hand, which adds an exciting and fashionable contrast. For those who appreciate modern style, Skagen’s black silicone strap watch with matching dial is the perfect accessory. It features a 40mm round face with minimal markers and a subtle date window. 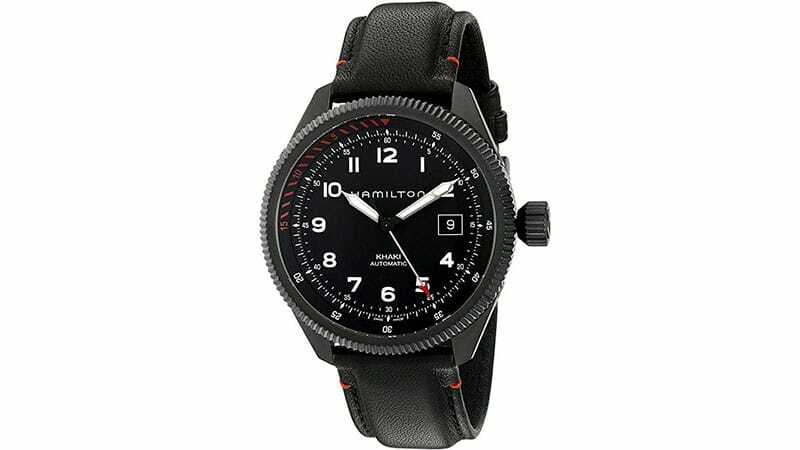 With a black dial, silver-tone hands, Arabic numeral hour markers, and a Swiss-automatic movement, Hamilton’s Khaki Field Swiss Automatic Dress Watch is both fashionable and functional. With a black dial, white hour markers, and white hands, Mondaine’s Helvetica Watch is easy to read and fashionably monochromatic. 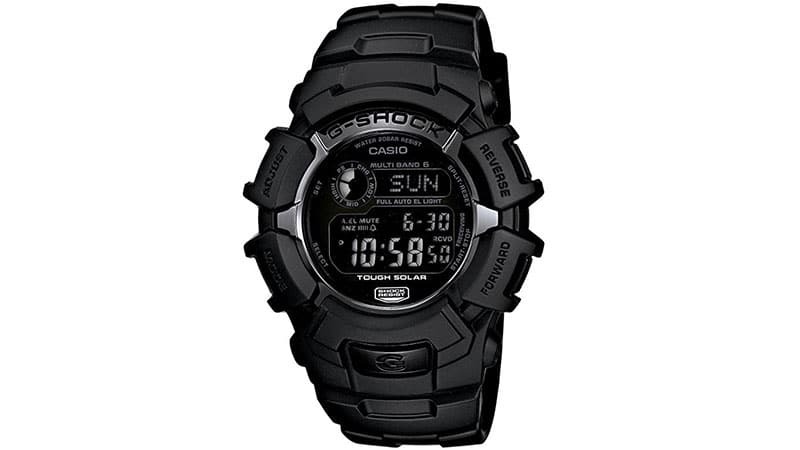 For those who prefer a digital timepiece, the G-Shock Shock Resistant Multifunction Watch makes an excellent choice. 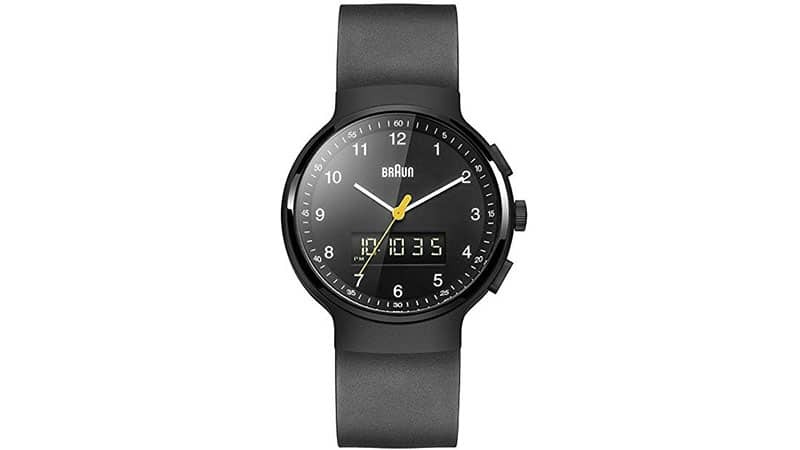 This stylish black watch boasts a variety of useful functions and features, including four daily alarms, 1/100th-second stopwatch, countdown timer, world time, a full auto EL backlight and solar power. 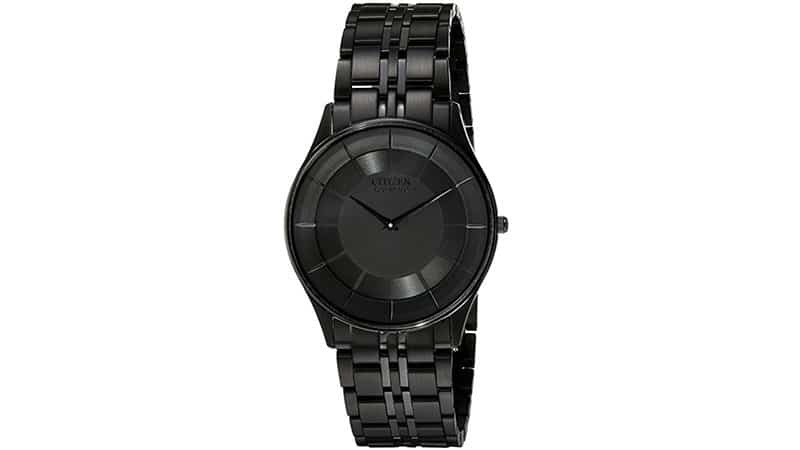 Thanks to its stylish appearance, the Citizen Men’s Stiletto Watch can take you from the office to off-duty with ease. There’s no need to worry about the battery running out, either, due to this timepiece’s handy Eco-Drive technology. Armani is known for its sleek and stylish aesthetics. 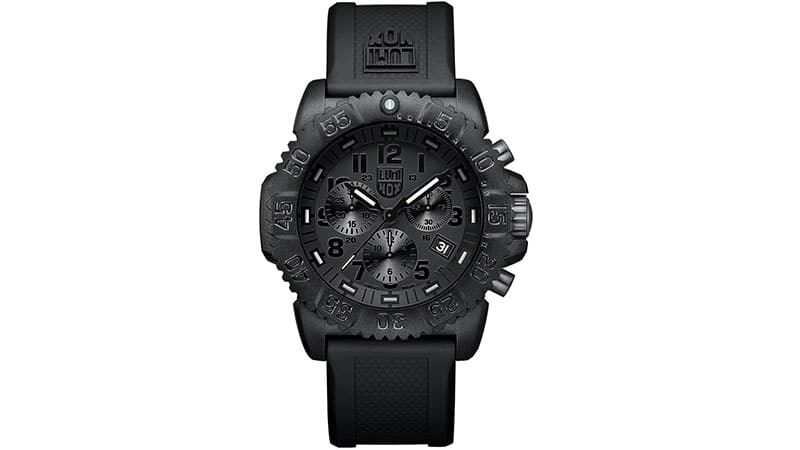 As such, it comes as no surprise that the label offers one of the most stylish black watches for men. 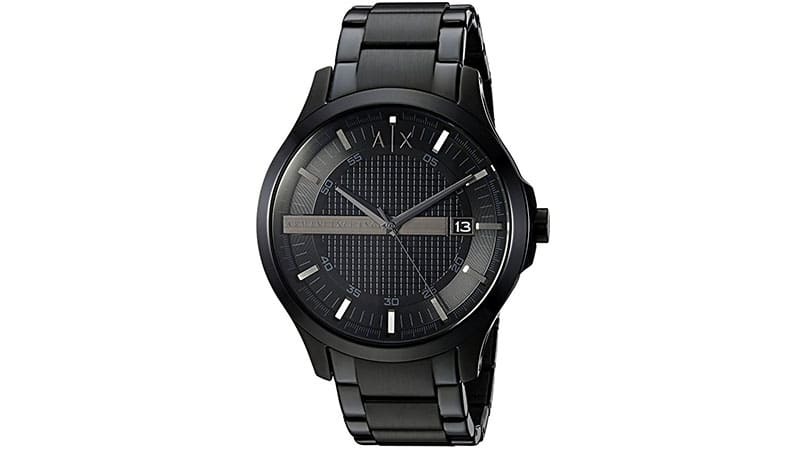 Featuring a luxuriously dark design and eye-catching grid-textured centre dial, the A/X Exchange Smart Stainless Steel Watch is sophisticated and exciting. 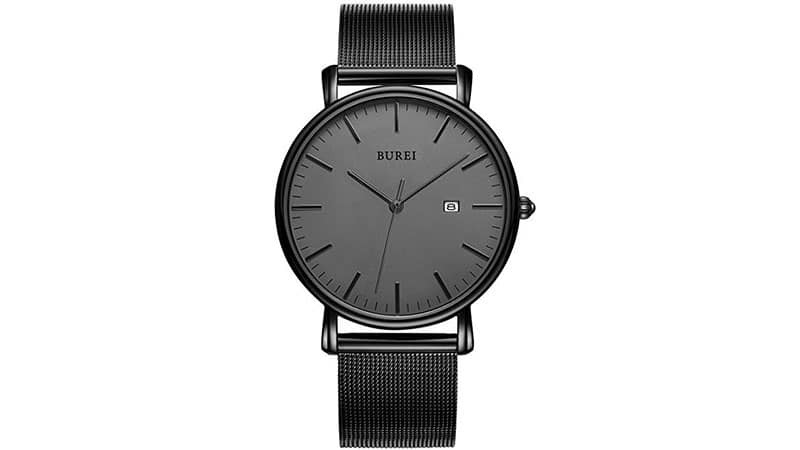 Burei’s Analog Deep Grey Date Watch with Black Milanese Mesh Band is fashionably minimalistic and highly functional. It features a sleek and simplistic design and boasts a Japanese quartz movement. On-trend fashion and sleek sports aesthetics come together in the Michael Kors Dylan Watch. The result is a smart yet athletic design that’s perfect for both the office and casual weekend outings. 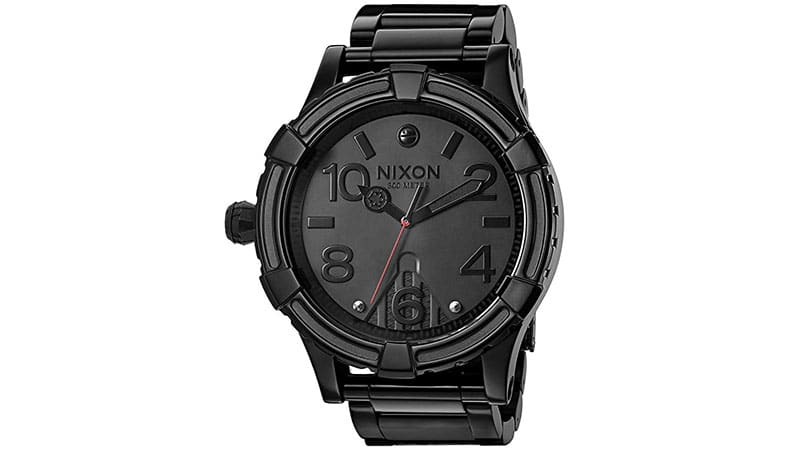 Featuring a dial inspired by Darth Vader’s ventilation mask, the Nixon Men’s 51-30 is the perfect accessory for any Star Wars fan. 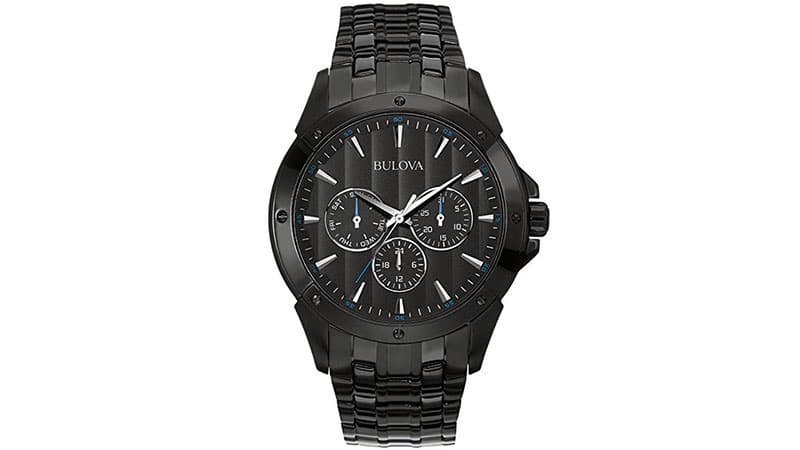 The Bulova 98C121 Watch is both contemporary and sophisticated. As such, this fashionable timepiece, which features a black dial with silver and blue accents, is an excellent addition to any modern man’s collection. 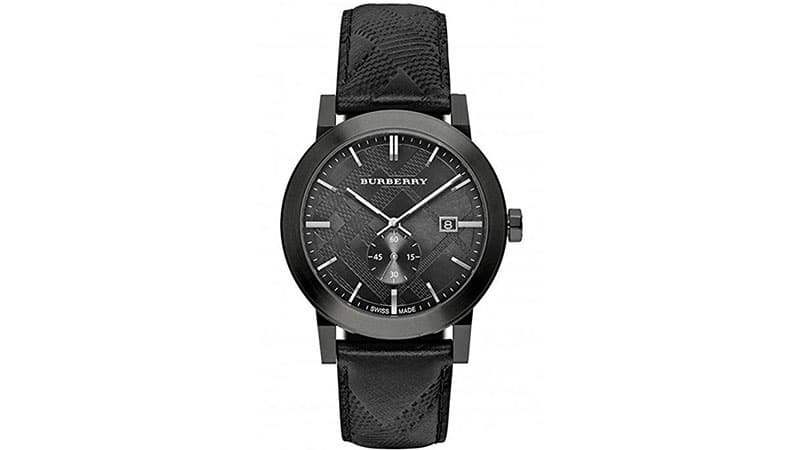 While Burberry’s iconic trench coast may be brown, one of the label’s top watches, the BU9906, is black. The dark timepiece is seriously stylish and boasts a case made of ion-plated stainless steel, which is complemented by a leather band. 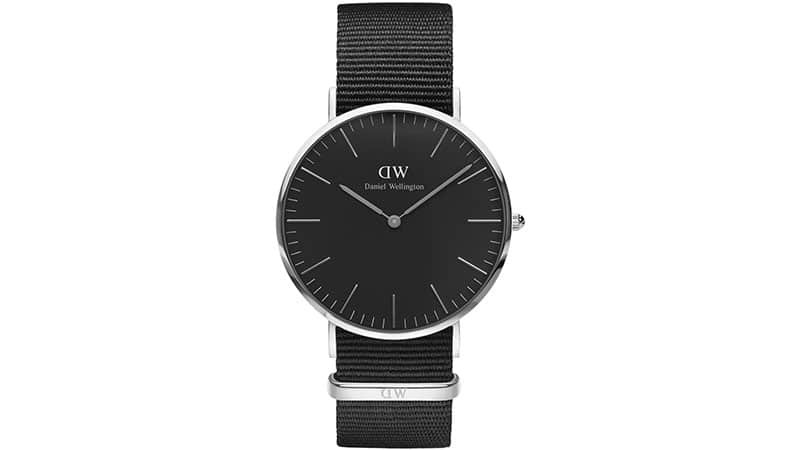 For the minimalistic gent, Daniel Wellington’s Classic Black Cornwall Watch makes a fantastic choice. 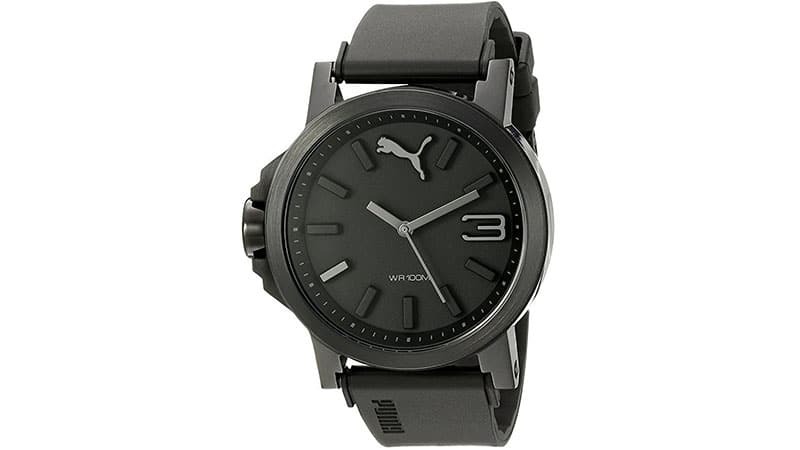 It features a 40mm round black dial, Japanese quartz movement and interchangeable strap. 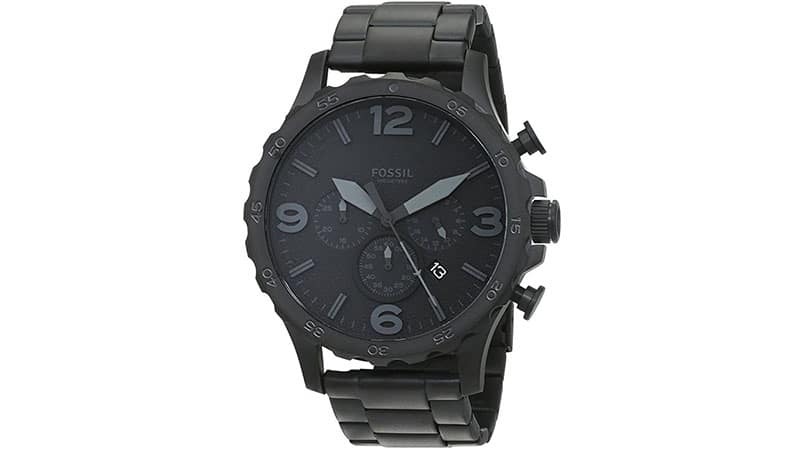 Fossil’s JR1401 Nate Stainless Steel Watch boasts a cool matte black design and a large 50mm case. Its dial features a date window, three subdials, and sword-shaped hands. 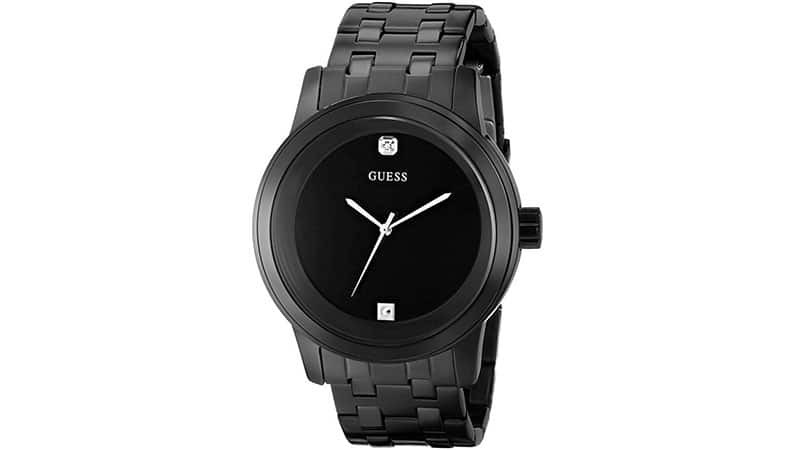 Guess has found the perfect blend of masculinity and luxury with its U12604G1 Watch. Featuring a numberless black dial with a diamond marker 12 o’clock, this excellent timepiece is ideal for dinners, cocktail parties and more. Nixon’s A197-195 Silicone with Grey Dial Watch features a cool and casual aesthetic that makes it an ideal accessory for the weekend. When it comes to functionality, this handy timepiece boasts a digital display with day/date and temperature features. 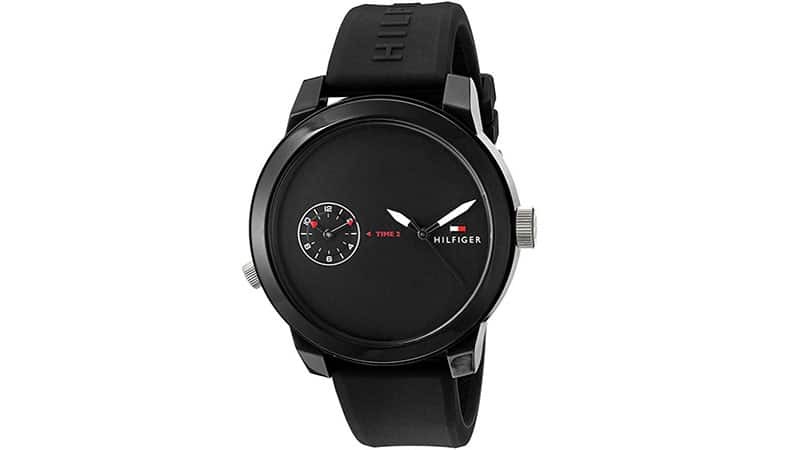 A black, stainless steel case, dial, and silicone strap make Tommy Hilfiger’s Cool Sport Watch a fashionable timepiece. Its serious-meets-sporty design, which features a simplistic yet innovative dial, is one that works perfectly with a range of outfits. 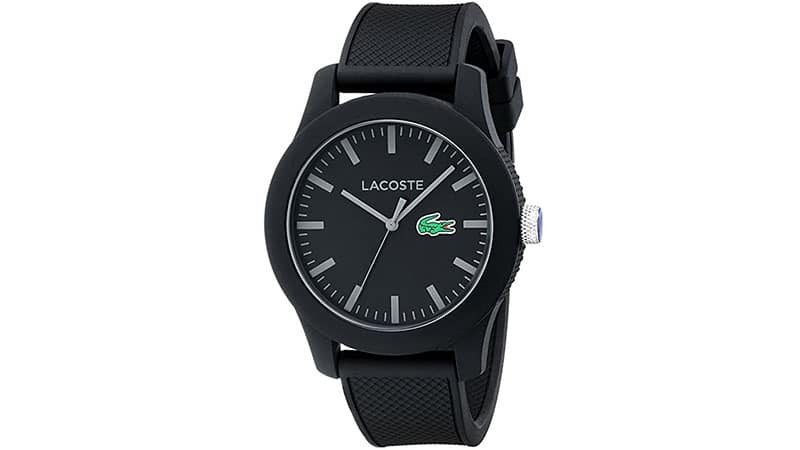 If you’re looking for a stylish watch that’ll take you from the tennis court to the bar, you can’t go past the Lacoste.12.12 watch in black. Featuring a black face and band with orange hour markers, day/date display and seconds hand, the Swatch SUOB704 Dark Rebel Watch is casually cool and simple to read. 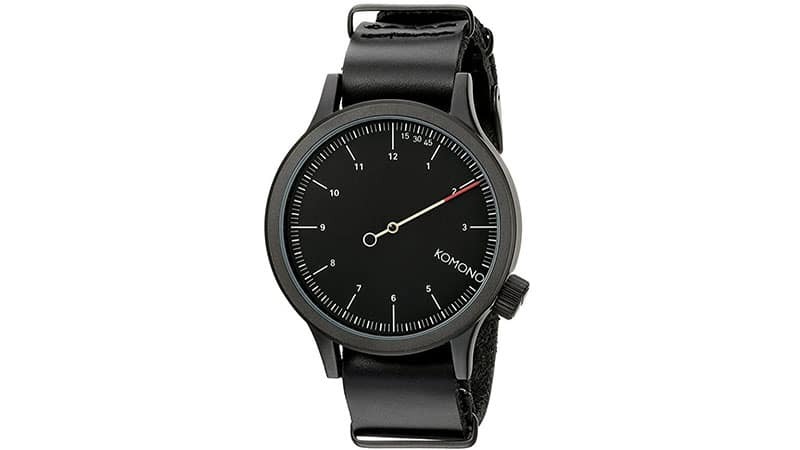 Boasting a matte black metal case and black genuine leather band, the Komono The One Watch features a luxurious look and feel that’s perfect for every day. 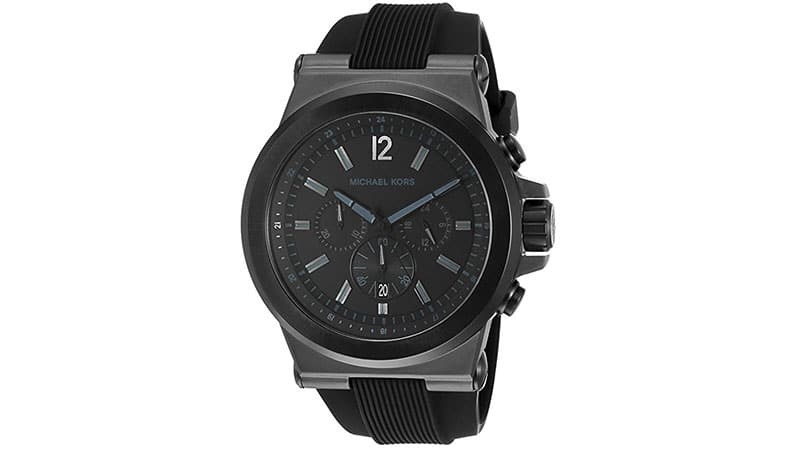 Want a black watch with a point of difference? 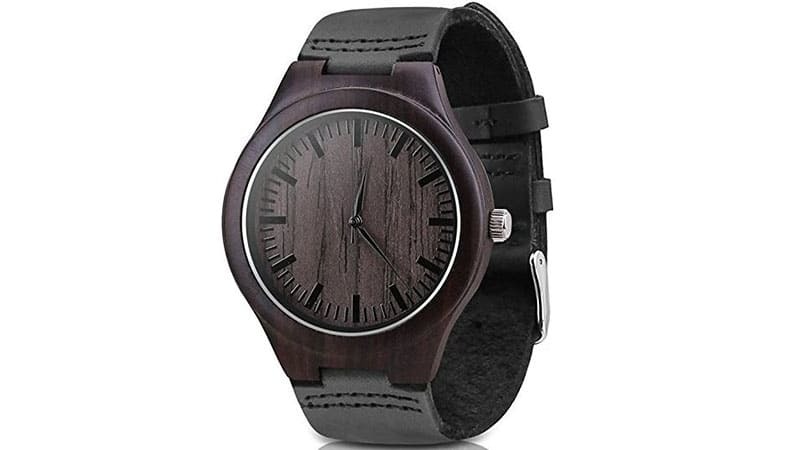 Consider Mercimall’s Black Wooden Watch with Leather Strap for a unique yet stylish appearance. If you’re looking for a masculine watch, you can’t go past a black design, and Diesel’s Armbar Silicone Watch is one of the best around thanks to its bold design. Can’t decide between an analogue and digital display? Why not get both with the Braun Analog-Digital Display Watch? This innovative timepiece combines both options in a modern and fashionable design. Featuring an oversized case and crown and a 3D dial design, the Puma Ultrasize 45 Watch appears bold and brilliant on your wrist.